This is a shout out to all the Anons who have worked so hard for months on the Q boards to bake Q's drops for us. THANQ, Anons!. The Q team doesn't like it when they receive praise, but hey, they don't have time to read websites (FR) and besides, they can't stop me! It just needed to be said. 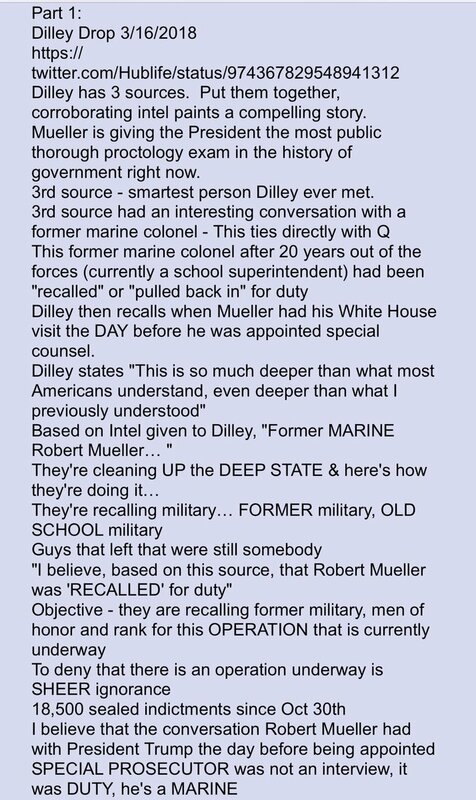 Mueller whom is a US Marine is being activated? Timing uncertain, as it should be. Might be trying to rattle some minds, cause moves. Yes. Too many impatient folks around here. impatient isn't the word for me. Confused as hell. 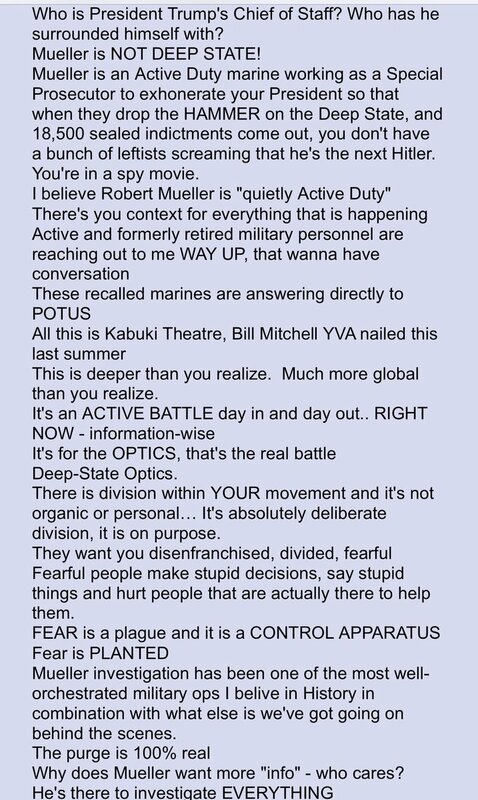 Mueller not deep state? He was head of the FBI during 9/11. Good that the red-pilling is spreading ! Confusing? Sure is. That would back up what LS has been saying all the while. All I can tell yo7 is the activity tonight out of Nellis AFB is nonstop. Might be an exercise but not a moment when you dont hear jets overhead here near their flight path. Will you post link to your info about bots? Talking about singing, this should get everyones attention. This is from an anon. He picked up a tweet from Dilly on 25 Jan and matched with Q post 15 March. For those not familiar with Dilly, apparently "several" not one Q "like" sources have been feeding him data. The data that I have seen, seems to fill in the blanks of the Q post as you see here. For y'all singing about McCabe see note. All of it is of interest. Are we having fun! Freeper who has been saying that this whole Mueller/Sessions thing is a distraction from the real purpose. Yaggg... its like hes doing Skeletors sister! One of my very favorite President Trumps events. He is fearless and funny. Cant say that for Cardinal Dolan. Pray for the safety of him and his family. Ah, bag, theres a period after charges, is that your typo? We are just seeing a repeat of history as told in the Bible. Particularly the first Anti Christ - Nimrod. A plan that has failed a number of times since then. “We shall unleash the Nihilists and the Atheists, and we shall provoke a formidable social cataclysm which in all its horror will show clearly to the nations the effect of absolute atheism, the origin of savagery, and of the most bloody turmoil. At this point, they will install their beast system, anti Christ, and the deceiver will try to rule the Earth. Source: The Rise of the NWO, The culling of man.